This year, the humpback whales took their time arriving in Hawaiian waters. But, they’re here now! In fact, I’m fortunate enough to see them from my home, and it’s a spectacular site! 1. Makapuu Lighthouse: To get there, you’ll travel east on Kalanianaole Highway towards Makapuu Point. The site is approximately 4.5 miles from Koko Marina Shopping Center. Look for trail entrance on the right hand side of the road before the scenic lookouts. A black gate indicates the start of the trail, and a paved parking lot is available off the main road. A 1-3/4 mile hike (approx. 30-45 minutes) up a 30 degree grade is required to get to the site. The semi-paved trail is at a moderate slope. Windy conditions at the top. 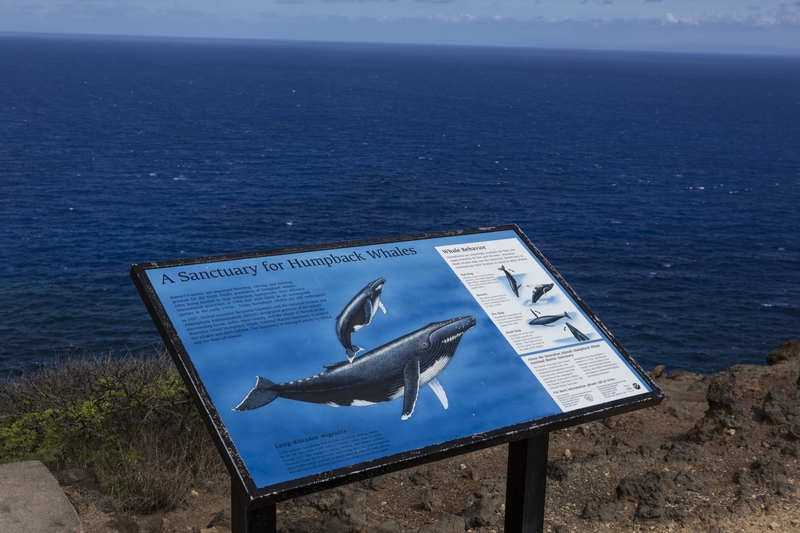 Viewing stations near the Makapuu Lighthouse means you can learn about the humpback whales as you look for them. 2. Halona Blowhole: If you’re coming from town, travel east on Kalanianaole Highway towards Hanauma Bay. Halona Blowhole is the second lookout area past Hanauma Bay. If you’re coming from Kailua, travel south on Kalanianaole Highway through Waimanalo past Sea Life Park and Makapuu Point. A paved parking lot is available off the main road. Site is the large lookout just past Sandy Beach. Easily accessible from the main road, high vantage point for viewing. Can be very hot or windy, dress accordingly. 3. Hanauma Bay: Travel east on Kalanianaole Highway towards Makapuu Point. Entrance to Hanauma Bay will be on the right, not far from Koko Marina Shopping Center. Parking is available in the Hanauma Bay lot ($1 per vehicle). Whale watching is best done from lookout points. 4. Diamond Head Scenic Lookout: Heading east on Diamond Head Road, look for the second lookout after the lighthouse. If you’re coming from the Kahului Airport, take Highway 380 W. and, then, turn left on Puunene which turns into Highway 311. Then, turn left (South) on South Kihei Road to 726 S. Kihei Road. From Lahaina, take Highway 30 to Maalaea, turn right on Highway 31 N. Kihei Road, then turn right on South Kihei Road to 726 S. Kihei Road. Parking is available. Viewing scope is available on site. Be sure to visit the Education Center. 7. 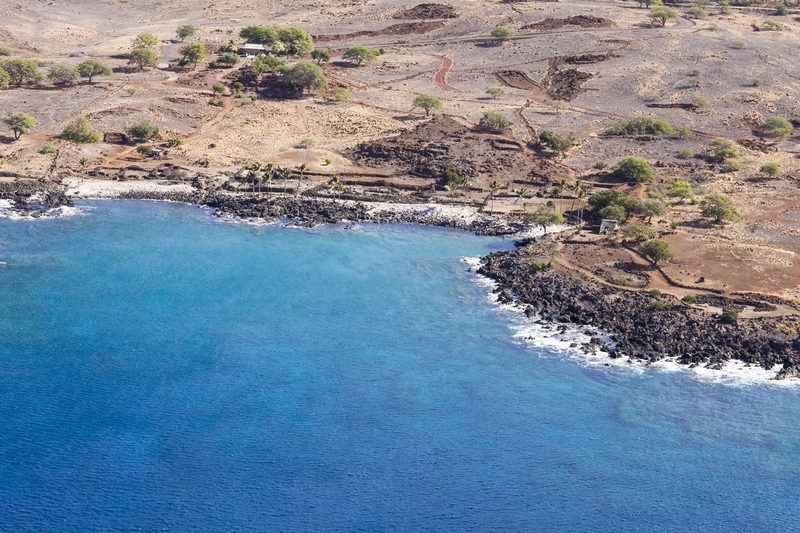 Lapakahi State Historical Park: Take Highway 270 north of Kawaihae at mile marker 14. The site is located 100 yards past the gate at the top of the hill. Approximately 1/2 mile from shore. Look for the sign on roadway. Parking available. Lapakahi is a cultural and historical state park. Hot, bring umbrella! Lapakahi State Historical Park on the Big Island is a great place to view humpback whales, and it offers a look at some untouched land in Hawaii. 8. Kapaa Beach Park: > Site is located off of Highway 270 (Pule Highway). Traveling north, turn left on the one-lane paved road just past mile marker 16. Site is located at the end of the road. Adequate parking is available for approximately 10 cars. Covered picnic pavilions are available. Hiking trails lead off the site. 9. Kilauea Point National Wildlife Refuge: If you want to see humpback whales early in the morning, meet at the gated entrance to the Kilauea Point National Wildlife Refuge by 7:15 am. The site leader will get the volunteers through the gated entrance, since the refuge does not open to the public until 10 am. All cars will be allowed to drive through the gate and park in the public parking lot. Volunteers will walk out to the point and set up an observation area. Public parking is available at the refuge. No pets are allowed. This is a wildlife refuge where human food consumption is strictly limited because of the potential for ants, rats, and feeding native wildlife. 10. Kapaa Overlook: This is the paved pull-off along Kuhio Highway located between Kapaa town and Kealia Beach.Parking is available at the lookout. Besides extraordinary views of humpback whales, you’ll also get an excellent view of the Kapaa reef. Although these are some of the best shoreline whale watching sites in Hawaii, the best views may be from a boat. Hawaii Aloha Travel offers amazing discounts on Maui Whale Watching excursions, and for many visitors, seeing a whale boat-side is much preferred to viewing whales from the shoreline.